The menu swings wildly around here guys and yes, I realize it’s the middle of winter, but sometimes you just need a taste of summer to get you through the long cold days…and nights, which is when cravings for these sorts of things happen, right? No matter how snowy or frigid it is outside, one taste of these easy-to-make and easy-to eat lime pops and you’re instantly transported to a warm, sunny tropical beach without a care in the world. If winter is making you antsy, you owe it to yourself to whip up a batch! 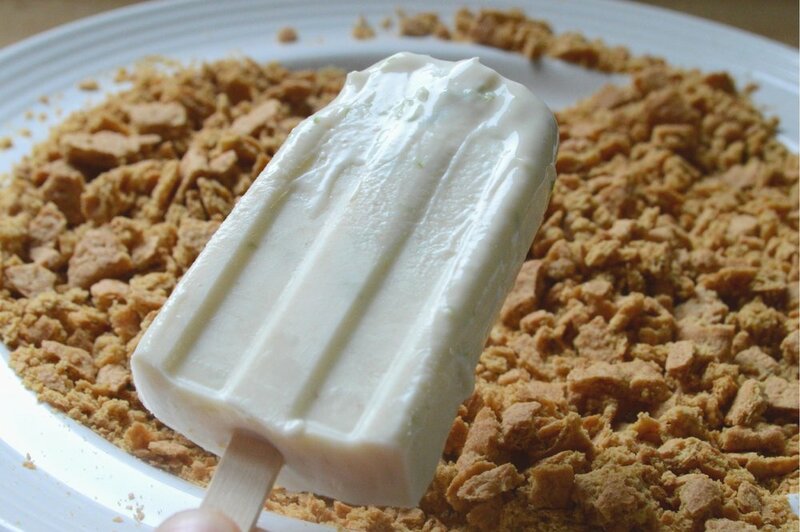 If key lime pie makes you dreamy, you are truly going to adore these because they really are like frozen key lime pie on a stick, complete with graham cracker crust! Creamy, tangy and intensely lime-y, with the crunch of shards of graham cracker, every bite is luscious! Plus, they come together in about 5 minutes. The hardest part is waiting for them to freeze! Once you’ve achieved that frozen state, you simply coat them in broken-up pieces of graham cracker (or any of your favorite cookie) and consume! As you can see, we hated them! So crank up the heat, or wrap yourself in a blanket ‘cause it’s popsicle time! I promise the shivering will be worth it! You will need popsicle molds or some sort of cup or container to freeze the popsicles in, plus sticks. Place all the ingredients except the graham crackers in a medium bowl and whisk together well. Divide the mixture evenly among the popsicle molds, insert the sticks, cover and freeze until firm, at least 4-5 hours. 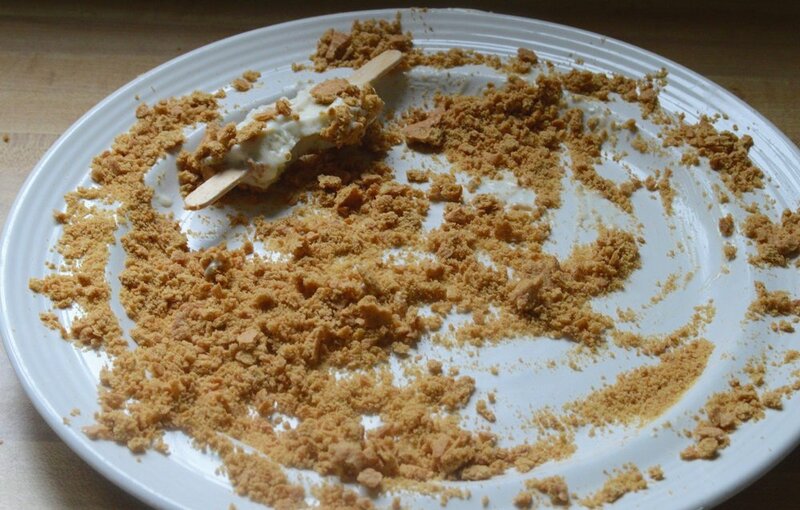 Place the crushed graham crackers on a plate. Unmold the pops and lay each one individually on the plate, pressing the crushed pieces onto the pop. Wrap in plastic wrap and return to freezer or eat immediately. Pops will last at least 1 week in the freezer, well wrapped, if they make it that long! Note: Recipe adapted from Paletas by Fany Gerson. While it’s best to use fresh limes, you can definitely sub in Nellie & Joe’s Key West Lime Juice in a pinch. I probably wouldn’t use just regular bottled lime juice though.